Is there a “middle way” to effective climate policy? A policy that makes sense regardless of whether you’re panicking over mass extinction or not quite sure the climate threat is serious? A policy whose cost-effectiveness predominates over other policies so strongly that it appeals to both small government conservatives as well as environmental activists? In his new book, “Paying for Pollution,” economics professor Gilbert E. Metcalf lucidly demonstrates why a well-designed carbon tax is that middle path. And, he shows why there are no good alternatives if we are serious about curbing our growing exposure to climate risk. Prof. Gilbert E. Metcalf, Tufts University. Metcalf certainly knows the features and pitfalls of the carbon pricing terrain. For two decades, he has focused on the role of tax policy to correct market failures. (A decade ago, after hearing his testimony encouraging the House Ways & Means Committee to propose a simple carbon tax or to simplify the behemoth cap-trade-offset bill emerging from the Energy & Commerce Committee, I had to resist the urge to stand up and applaud.) And he’s served in government, as Deputy Assistant Secretary for Environment and Energy at the U.S. Treasury from 2011-12. Metcalf opens his book with a bird’s eye view of climate science, which through an economic lens, is telling us that we face serious and growing climate risk. That risk comes in the form of “known unknowns” such as more frequent and more damaging events like storms, floods, droughts and wildfires as well as “unknown unknowns” such as rapid methane release from Arctic permafrost and ocean clathrates. By analogy to Blaise Pascal’s famous theological wager about the existence of God, Metcalf suggests that even climate science skeptics would be wise to hedge their bets by supporting least-cost climate policy, for the same reasons they would buy fire insurance for their houses. Metcalf introduces us to Ronald Coase, awarded a Nobel in 1991 for the insight that pollution rights can be allocated efficiently only if the parties hold explicit property rights, allowing them to negotiate. Next, we meet Arthur Pigou, who first observed that taxing pollution instead of beneficial activities can improve aggregate welfare by discouraging and reducing the unpriced costs of pollution. Pigou’s further insight was that the benefits of pollution taxes can offset much (sometimes all) of the economic drag normally associated with taxation. 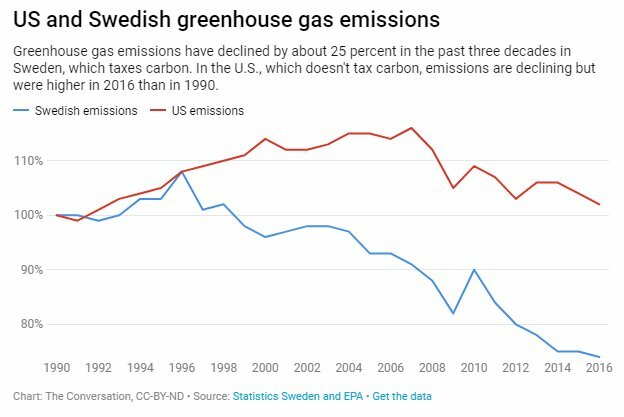 Having neatly laid that groundwork, Metcalf turns to a real-world example: Sweden, which imposed a hefty $130/t CO2 tax in the early 90’s, using the revenue to reduce other taxes and equalize tax burdens. Sweden’s carbon tax has gradually but dramatically reduced its CO2 emissions, even as its economic growth has surged along a similar trajectory to that of the U.S. Similarly, British Columbia imposed a revenue-neutral carbon tax in 2008 that has apparently reduced the province’s emissions while its economic growth exceeded the rest of Canada. My favorite of Prof. Metcalf’s chapter titles is “Isn’t There a Better Way? (No, There Isn’t)” Here, Metcalf sets forth four criteria for climate policy. First, it should actually reduce emissions. Second, it should be cost-effective, delivering maximum efficacy per cost. Third, it should encourage innovation. And finally, it should be simple and transparent, to minimize administrative burdens and costs while limiting gaming and political meddling. Metcalf walks us through real-word examples of alternatives to carbon pricing: regulations and subsidies. As examples of regulations, Metcalf examines performance standards and technology mandates EPA issued under the Clean Air Act. These encourage industry to comply by adopting the technology that EPA used to establish the standard; thus they don’t encourage much innovation. One example is the 1977 Clean Air Act mandate for power plants to install equipment to reduce sulfur emissions by 70 – 90%, regardless of the initial emissions rate. Congress chose this mandate to protect high sulfur eastern coal. Under the rule, dirty power plants that were burning high sulfur coal as well as cleaner ones that already had reduced emissions rates by burning low sulfur coal were forced to install scrubbers. Metcalf points out estimates that it would cost roughly half as much to price sulfur dioxide emissions and let power plant operators choose whether to reduce emissions by installing scrubbers or buying western low-sulfur coal. Automobile fuel efficiency (“Corporate Average Fuel Efficiency” or “CAFÉ”) standards might seem reasonably cost-effective, but because Congress included an exemption for light trucks, CAFÉ standards encouraged a perverse boom in gas-guzzling SUV sales. And the mandate for more efficient vehicles without a price on carbon has created a rebound effect. People drive their more efficient cars more miles, eroding net emissions reductions. Metcalf cites a study by Resources for the Future concluding that the average cost of reducing a ton of CO2 emissions via CAFÉ standards is about $85/ton, while a carbon tax would do the job for only $12/ton. Other alternatives to carbon pricing include subsidies and mandates. State-imposed Renewable Portfolio Standards (RPS’s) require utilities to generate a specified fraction of electricity from renewable sources. Metcalf points out that these rules do not encourage consumers to conserve electricity. A new study found that to reduce carbon emissions from electricity generation by 10%, an RPS program costs six times what carbon tax would. The federal government offers subsidies in the form of Production Tax Credits (PTC’s) to generators of wind and solar power. But by putting more power on the grid, the PTC reduces electricity prices, thereby increasing demand. Subsidies for hybrid cars mostly benefit the wealthy; with or without the subsidy they are the market for expensive hybrids. And policy interactions can create perverse incentives. Because CAFÉ imposes average fuel efficiency on each manufacturer’s fleet, selling an efficient hybrid in one place allows that manufacturer to sell an additional gas guzzler somewhere else. On the “innovation” criterion, Metcalf points out the deep body of research concluding that zero-carbon energy R&D in both the public and private sector are woefully underfunded in terms of cost vs social benefits. By predictably increasing the cost of fossil fuels, whose prices now undercut cleaner alternatives, a carbon tax would provide incentives for private investment in clean energy R&D. Metcalf suggests the revenue from eliminating fossil fuel subsidies as a source of funds for public investment in clean energy R&D. Having demonstrated the advantages of carbon pricing over regulations, subsidies and mandates, Metcalf proceeds to compare quantity-based carbon pricing mechanisms (caps) with price-based mechanisms (taxes). In theory, Metcalf concedes, a cap-and-trade system can price carbon just as efficiently as a carbon tax. But in practice, the results of cap-and-trade have not been impressive. Both the California system and the European Union’s “Emissions Trading Scheme” have been plagued by price volatility and carbon prices too low to have much effect on demand or innovation. To stabilize prices, “collars” have been added to both systems. When triggered, an upper price limit effectively releases the emissions cap by issuing more allowances. And a price floor obligates the government to buy back allowances in order to prop up market prices. Thus, a cap-and-trade system with a price collar operates like a tax with a lot of needless complexity that increases opportunities for fraud and abuse. Metcalf also points out that only a carbon tax continues to prod further reductions even when standards, regulations and mandates have been met. When revenue from a carbon tax is returned via equal lump sum rebates (a.k.a., “dividends”) the net distributional effect becomes even more progressive. Another option is to use the revenue to reduce the top marginal corporate income tax rate. Not surprisingly, this option is regressive, but would have offered large efficiency benefits. Alas, Congress cut the corporate income tax rate in 2017 (without paying for the expenditure, thus substantially increasing the deficit) seriously blunting the efficiency argument for using carbon tax revenue to further cut corporate income taxes. Perhaps surprisingly, Metcalf’s book does not mention his proposal from a decade ago to use carbon tax revenue to rebate payroll taxes, an option that he showed would be distributionally-progressive and which was incorporated into a bill introduced by Rep. John Larson (D-CT). Metcalf overviews “best practices” for carbon tax design. His touchstones are administrative simplicity, low compliance costs, broad coverage (avoiding exemptions) and a substantial enough price signal to actually reduce (and continue to reduce) greenhouse gas pollution. For simplicity, a carbon tax should be imposed at the narrowest point in the respective supply chains of coal, oil and natural gas – where there are fewest taxpaying entities. Metcalf suggests including some non-CO2 greenhouse gases, including fluorocarbon refrigerants. But he concludes that to discourage fugitive methane emissions from oil and gas wells and gas distribution systems, technology-based regulations make more sense than a tax. Metcalf invokes the standard free trade based arguments for border tax adjustments which would exempt exports from carbon taxes to avoid putting them at a competitive disadvantage, while imposing carbon taxes on energy-intensive imports in order to avoid favoring imports. The carbon tax rate and its rate of increase are rivaled only by broad coverage as a crucial design elements to assure effectiveness at reducing emissions. Metcalf suggests skipping over the controversy and uncertainty surrounding how to estimate the “social cost of carbon,” instead just choosing a future emissions target and periodically adjusting the tax rate along the way to stay on track. In a chapter titled “Objections to a Carbon Tax,” Metcalf debunks the myth that carbon taxes will hurt the economy or “kill” jobs. Citing standard macro-economic models, Metcalf assures us that economic growth will overwhelm whatever small economic drag might be created by carbon taxes. And that analysis does not include the much larger benefits of reducing future climate damage. Metcalf agrees that transition assistance is needed for coal miners and other fossil fuel workers displaced by the transition to low or zero-carbon energy, but he is quick to attribute the lion’s share of coal job losses to the shale-gas boom that has driven natural gas down to prices that encourage utilities to replace coal-fired generation with gas. He points out that the transition to a low carbon economy will create far more jobs in renewable energy than are lost in fossil fuel related sectors. Metcalf also deftly dispatches the argument that a carbon tax imposed by the U.S. wouldn’t matter. He points out that border tax adjustments offer a prod to other nations to enact their own carbon taxes, and he assures readers that leadership by the world’s largest economy really does matter, perhaps especially on climate policy. In his final chapter, Metcalf offers a passing glance at the elephant in the room – political resistance to carbon taxes. He recalls the two principles of President Reagan’s 1984 speech which spurred Congress to enact comprehensive tax reform two years later. First, the reform had to be revenue neutral, and second, it had to lower tax rates by broadening the tax base and cutting out loopholes. Metcalf suggests that in order to sidestep the politically-charged debate over the “size of government,” carbon taxes should also be revenue-neutral. Metcalf says his biggest worry about climate policy is not that we will not enact it, but rather that we will choose inefficient policies. Noticeably absent from Metcalf’s carefully-balanced map of the “middle way” to a carbon tax is an appeal to the environmental left. Judging by reports about the “Green New Deal,” progressives seem to be jumping on the bandwagon for a range of inefficient and possibly ineffective regulations, subsidies and mandates. Some advocates have even gone so far as to explicitly exclude carbon taxes. Maybe Metcalf is right to be worried. Readers (like me) who are more concerned about environmentally effective climate policy than about efficient (low-cost) policy can safely substitute the word “effective” in the many instances where Metcalf points out the efficiency (or cost-effectiveness) of carbon taxes. My assumption is that in a world where climate policy is constrained by political ambition, the most efficient policy is also the most effective. Of course, we climate hawks still have our work cut out to ensure and maintain an aggressively-rising carbon price, but the efficiency advantage of a carbon tax will pay off at any given level of political ambition. Metcalf notes that Congress eliminated this perverse provision in the 1990 Clean Air Act Amendments. In “Can We Price Carbon?”(2018) political scientist Barry Rabe points out the popularity of ad-valorem severance taxes imposed at the point of fossil fuel production in states including Alaska, North Dakota, Wyoming, Oklahoma, Texas and California. Rabe points out that these severance taxes could easily be converted to carbon taxes by changing their basis from the dollar value of the fuel to its carbon content. Either way, their burden would continue to fall largely on out-of-state fuel consumers while funding popular programs in the states imposing them. For instance, Texas endows its Permanent University Fund with revenue from oil & gas severance taxes. This suggests that a carbon tax without a border tax adjustment to return tax revenue to producers of fuel for export might be more politically popular than a standard WTO consumption-based tax. Metcalf cites MIT economist Robert Pindyck, who has called the models used to estimate climate damage and the social cost of carbon “close to useless,” but who nevertheless argues forcefully for a carbon tax despite uncertainty about the “optimal” rate. For a terrific political science overview of carbon pricing successes and failures, see “Can We Price Carbon?” (2018) by Barry Rabe, which I’ve reviewed here. Prices are the primary information signals in our market economy. As long as energy prices leave out climate and health costs, "free markets" are a lie; the un-priced cost of climate damage threatens to end our civilization. Fast Thaw — What Are Arctic Lakes Telling Us?